By sheer luck, I happened across the book The Red Leather Diary by Lily Koppel, on a table at Barnes & Noble. I’ve been focusing on reading fitness, running and nonfiction books lately, so when I read the back of this book and saw the premise, I was excited. The book begins with author Lily Koppel digging through a dumpster full of vintage steamer trunks located outside her apartment building. Along with vintage designer clothing, she is also led to a small red leather diary. Upon reading the book, Lily discovers that Florence Wolfson, owner of the diary, had an extraordinary life full of the arts and self-discovery. Florence is interesting and mature beyond her years. In the years immediately following the reemergence of the diary, Lily Koppel finds and meets Florence Wolfson. They form a friendship and learn that they are kindred spirits. The Red Leather Diary was a fantastic book. The author does a beautiful job in recreating scenes of old New York. It is easy to picture the city the way it was for young Florence. I felt as though I were experiencing Florence’s life right along side of her. 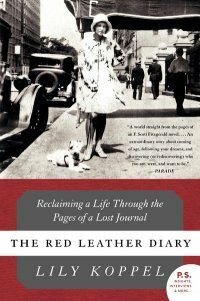 Well-written and beautiful, I recommend The Red Leather Diary to readers hoping simply to experience a bygone era or feel the hope of a young woman in an exciting city. Readers with a respect for history will also appreciate this book. Note that this book does discuss homosexuality, so some may find this book offensive or controversial.